Having picked up the original Tome of Beasts, Creature Codex (or Tome of Beasts 2, Electric Beastaloo) was nothing alien to me. This seemingly endless book of monsters and baddies for fifth edition was Kickstarted in January of 2018 successfully and surpassed their goal by quite a bit. As a personal fan of a lot of the content that Kobold Press puts out, it was a no-brainer to back this one for me. Once I received the book and flipped through it a bit I had a feeling that I would have a very similar opinion of it that I did of its predecessor. That is to say, one of mostly praise with a few minor details and pet peeves detracting from an otherwise indispensable resource for a fifth edition dungeon master. The first thing that will jump out at you about this book is it’s thick. Weighing in at 420 pages, Creature Codex is no small feat of writing on the Kobold Press team’s part. Like most monster books and bestiaries, they skip a lot of the extra stuff and give you what you’re looking for. Nearly the entire book is monsters with their complete stats along with some brief descriptions to give you some background information on them. As for the monsters themselves, oh boy is there a selection! More so than its predecessor, Creature Codex embraces how ridiculous monsters in D&D can be. They have some of the most creative and fun creatures I’ve seen in a very long time. A stand out is the sharkbowl ooze, which I equate to the gelatinous cube version of a Sharknado. Looking through the book I haven’t found anything that’s terribly unbalanced. Stat-wise, everything seems to be pretty on the nose. The few monsters I’ve tested from the book so far have proved to be a fun time. They have unique abilities that accurately represent what they’re supposed to be and generally create interesting situations for players to deal with. My favorite example is the Keg golem, which sprays alcohol at its opponents and potentially poisons them. It’s monsters like these that allow for interesting encounters that’ll surprise your players and create memorable gaming sessions. The variety of monsters is wonderful, ranging from some of the new and unique monsters they’ve dreamed up themselves as well as alternate and creative twists on some classic favorites. While for the most part the book contains wonderful content, there are a few pet peeves and minor issues I’ve found with Creature Codex. The first thing that jumped out at me was the quality of the pages. This might just be a personal preference for me, but I prefer glossy pages to matte. They feel more finished and polished. Creature Codex is all matte pages. I won’t be too critical though, since it is a larger book, and I don’t blame them for wanting to save on printing costs. Secondly, Creature Codex does feature a good amount of creatures that seem specific to the Midgard Campaign Setting, also by Kobold Press. While this in itself isn’t a huge issue, the book itself is advertised to be more of a general creature book. While I do think they accomplish that, I feel as though some of the campaign specific creatures feel out of left field. The book also contains no mention of the setting that the creatures are tied to overtly. It’d be nice to know that some of these are tied to a specific setting. 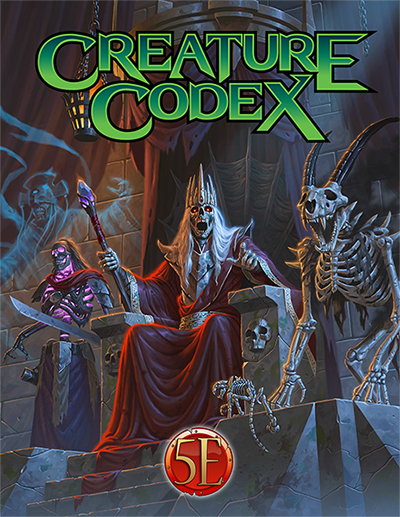 Overall I would 100% recommend Creature Codex to any GMs who need some new monsters to spice up their games. The variety and sheer number of creature options contained in the book makes up for whatever short comings one can find with some of the creatures. It’s going on my shelf right next to the rest of the books I consider essential to running a fifth edition game. If you’re interested in picking up Creature Codex head over to Kobold Press and check it out. If you already picked it up and have your own thoughts on the book feel free to leave a comment below or hit us up on social media with your reactions.